Diaper cakes are a great way to set the theme for your baby shower and create a uniquely wonderful gift for the mother to be! They make fun centerpieces for your gift table, your food table or even your entryway. Not only are they delightful centerpieces, but they generate a lot of conversation amongst your party guests. With all that "ooohhhing" and "aaahhhing" going on with your guests chatting over the creativity, fun and practical nature of your special gift, you get to bask in all the compliments. What a great way to get your guests to "break the ice" and interact with each other! If you're not the hostess for a baby shower, a diaper cake still makes a one of a kind baby shower gift for you to present to the mother to be. 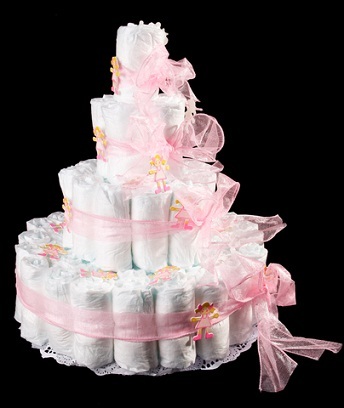 A diaper cake can be simple in design or totally over the top. It's all up to you, your creativity and your budget. From a simple cake with beautifully printed ribbons to one overflowing with all sorts of toys and baby essentials, the diaper cake is the perfect baby shower gift. They are easy to assemble, so anyone can "bake" a diaper cake. You also easily control the expense. The costs for the basic ingredients are the same whether doing a simple or elaborate design. Once you have the basic ingredients, how much more you want to invest is up to you and your pocketbook. There are several designs to consider before baking your diaper cake. Candlestick Method - basically rolled diapers so that they look like pillar candles. The rolled diapers are then bundled together to create cake layers. Boutique or Swirl Method - no rolling of diapers, rather. leaving them flat and fanning them out within a cake pan to create the layers. Square Method - so you prefer a square cake over a round? This simple stacking of flat diapers creates simple square layers. Wrapped Method - simply wrapping diapers around a center such as a bottle or cardboard tube till you create a layer. Decide what design you would like to use for your cake. Then purchase your basic ingredients. Once you have purchased your basics, determine what items you would like to decorate your cake with and add them to your ingredients. Keep in mind, you already have the most needed item any mother to be will need - DIAPERS! Nursery Rhyme Diaper Cakes - nursery rhymes are perfect themes! The Owl & The Pussycat Diaper Cake - delightful for a baby girl! Five Little Monkeys Diaper Cake - perfect for little boy! 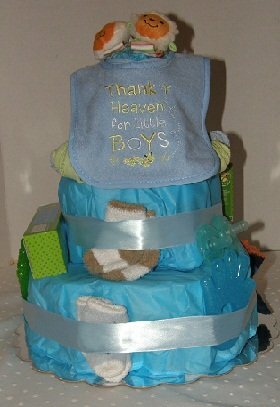 Little Boy Blue Diaper Cake - blue is great for baby boys! What Are Little Boys Made Of - dogs and snails and puppy dog tails!